Set Farmer stock images by Aurielaki. Worker Agricultural illustrations in EPS10 EPS JPG AI SVG. Flat tractor set. Farmer, agricultural worker with plant, chicken, sheep, rabbit, cow, milk, fruit or feeding farm animal. Harvest man with apple. Girl isometric images isolated on white background. SKU: Set-Farmer-Agricultural-Worker-AurielAki. 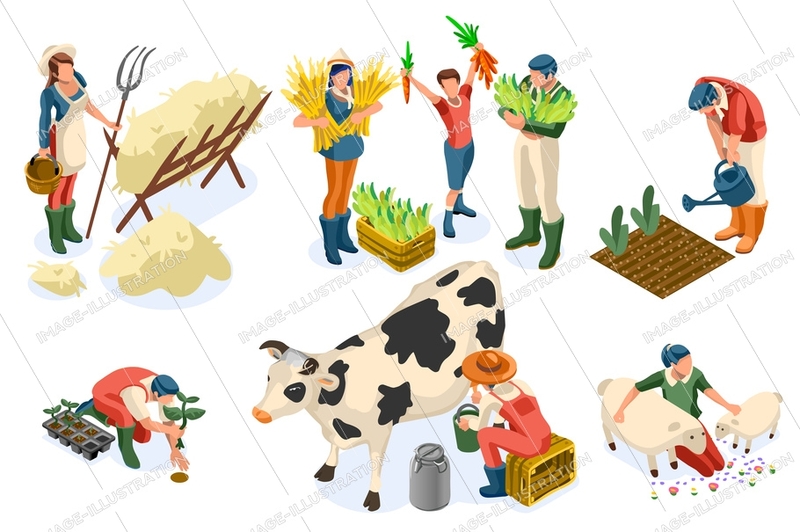 Categories: Farming People Vector, New. Tags: 3d hay, agricultural, agriculture, animal, apple, boy, bundle, carry, cartoon, character, chicken, collecting, collection, cow, crops, family, farm, farmer, farming, feed, feeding, female, flat, fruit, gather, girl, grow, guy, harvest, hay, isometric, male, man, milk, milking, people, pig, plant, rabbit, ripe, set, sheep, tractor, vegetable, watering, weed, woman, work, worker, workers.